Want to give an activity tracker a try, but you don’t like the plasticky, rash-causing silicon look to most devices? Fitbit may have the solution. Today, Fitbit is announcing a partnership with womens’ fashion firm Tory Burch to create a line of designer housings for its popular fitness monitor. So far, the collection consists of two designer silicone printed bracelets ($38; one blue, one pink), a brass pendant necklace ($175) and a brass hinged bracelet ($195). Mashable warns that the “material isn’t of the highest quality,” but the pieces are more than capable of hiding the tracker with a stylish flair. It’s a good solution for tracking your steps during a night out on the town, at a work meeting or anywhere else a plastic piece of tech might look out of place. 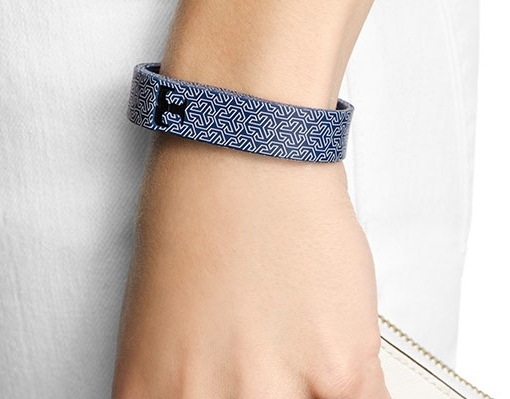 If you’re interested in taking a closer look at the new Tory Burch designs, the full line is available for purchase at the Fitbit website and at select Tory Burch stores.